Popcorn is not just the movies! 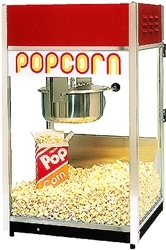 Our easy to use popcorn machine rental is ideal for any occasion. It features a glass cabinet with sturdy construction, an easy to access back door, a heat lamp, and a heated cabinet. You can make the popcorn ahead and keep it warm, or prepare it fresh in front of the crowds. It’s reliable, easy to use, and in our opinion, the ultimate popcorn machine! Comes with popcorn and serving bags for up to 70 servings.